Half an hour after sunset on Saturday, January 10, shy Mercury will be less than a degree to the right of the brilliant planet Venus. Mercury is one of the brightest planets in the sky, but very few skygazers ever see it. That’s because it never strays far from the sun, so can only be spotted on rare occasions when something happens to make it easier to see. Most people will find binoculars helpful in first spotting Mercury, though once you’ve seen it in binoculars, it should be visible without optical aid. After you've spotted Venus in evening twilight, look just to its right for Mercury, assuming you live north of the equator. If you live south of the equator, look below and to the left of Venus. 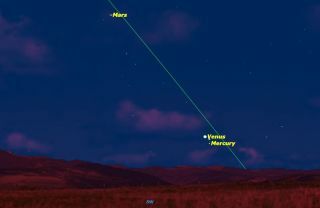 Although Mercury and Venus will be closest on Jan. 10, they will be less than a degree apart from the Jan. 8 to Jan.12. Check them out on any of these nights, and watch their rapidly changing positions. Mercury reaches its greatest distance away from the sun on Jan. 14, while Venus' distance will be constantly increasing until it reaches its own greatest elongation on June 6. Although these two planets appear close together in our sky, they are actually quite far apart in space. Mercury is currently just a little bit further away from Earth than the sun (100.3 million miles, or 161.4 million kilometers). Venus, meanwhile, is much farther away at a distance of 147.4 million miles (237.1 million km) from Earth, on the far side of the sun. The geometry of the two is quite different, with Mercury 71-percent illuminated from the side like a slightly gibbous moon while Venus is 95-percent illuminated, like an almost full moon. After their five days in close proximity, the two planets will moverapidly apart, Mercury moving to conjunction with the sun on Jan. 30 while Venus will shine brightly in the western sky until early August. While observing Mercury and Venus, be sure to check out Mars, which is visible a bit higher in the western sky. Mars is sinking rapidly in the west towards its own conjunction with the sun on June 14. Editor's note: If you capture a striking image of Mercury and Venus in the night sky, or any other night sky view, and would like to share it with Space.com, send photos and comments in to managing editor Tariq Malik at: spacephotos@space.com. This article was provided to SPACE.com by Simulation Curriculum, the leader in space science curriculum solutions and the makers of Starry Night and SkySafari. Follow Starry Night on Twitter @StarryNightEdu. Follow us @Spacedotcom, Facebook and Google+. Original story on Space.com.